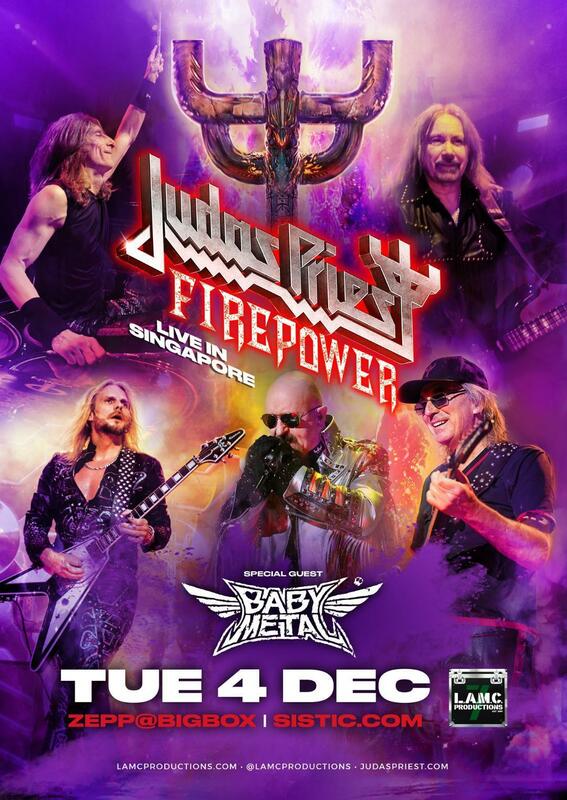 Legendary English heavy metal band Judas Priest will be returning to Singapore this December after six long years. Judas Priest formed in West Bromwich in 1969. With 18 studio records spread over a remarkable 49-year-long career, the band has solidified its spot as one of the greatest bands of all time. Earlier this year, the band released its latest album, Firepower, which was has been lauded as the band's best record since 1990's Painkiller. The band will be returning to Singapore for the first time since 2012 this December in support of the record. Bandwagon had the chance to speak to the frontman of Judas Priest, Rob Halford. We spoke to him about the band's return to Singapore, how BABYMETAL is revolutionizing the heavy metal landscape, the legacy he hopes to leave behind with the band and more. Check out the complete interview below. Hey Rob, how are you? I'm good! I'm so good! Priest is coming back to Singapore! Has it really been six years since we last played there? Isn't that crazy? It's like time is moving at the speed of metal (laughs). It's unbelievable how fast metal goes in your life. I can vividly remember flying into Singapore, and being greeted by fans at the airport, which is always nice, and then we had a gorgeous drive to the Marina Bay area, that's an absolutely beautiful place. We came in a few days earlier so we had a couple of days to really enjoy Singapore and explore the city. Singapore's one of the most astonishing places I've ever been to and I absolutely can't wait to be back. I've also heard we'll be playing at an indoor venue this time around, and I'm so happy for that because I'll tell you what, Singapore's heat matches its beauty. It's bloody hot, and we're from England, it's not hot there (laughs). I'm sure the girls from BABYMETAL will appreciate that too. I think BABYMETAL are one of the most unique metal experiences in the world right now. Not only their appearances, and their style and everything that surrounds them visually but they're an incredible band as well. I met the band a couple of years ago in America and they're so passionate about metal, they know everything about metal music and they've created a very special feeling and experience within the entire world of metal. They work extremely hard to create something unique and I think it's paying off and they're doing such an amazing job. In fact, I was watching the new music video for 'Starlight' and even with one member leaving, they still sound great. Earlier this year, you released Firepower, one of the band’s best records. How does it feel to see the music you release get such love from critics and fans alike after having spent so long in the industry? It's a mixture of emotions. We're definitely very humbled, extremely grateful, thrilled, motivated, it's just an incredibly uplifting time for Judas Priest and I think it also reemphasizes the fact that music kind of takes a life of its own when you release to your fans around the world. It connects the metal family, the Judas Priest family and in Singapore. Those are the emotions that pop into my head almost immediately: Just a lot of gratefulness. Over the course of the past five decades, has the band changed the way it works in the studio? The one really unusual, well, not really unusual... but it's definitely something we had not done in a long time was actually being in the studio together, playing as a band. As time went on, technology has made it such that you can build a record piece by piece and layer one thing over another so you don't need the entire band there for a session. But we decided to go back to our roots and earlier style of recording and did it as one unit. I think with Firepower, you can really get the sense that the band was actually playing together and the soul and spirit of the live performances is captured in a very special way. It's like being on stage, except you're in a studio. You get a performance on an energy level that is particularly being locked into the wired recording. I think that's the main characteristic that set Firepower apart from many of the previous records. Metal musicians have long been critiqued for taking themselves too seriously. What’s your stand on the issue? You know what's funny about this? Some of my friends musically are quite extreme. They have performance personas that are quite strong, but the other side of them is something you might never or rarely see. That's a question of character as well and what you're try say and how you're trying to present yourself. With Priest, we've always made sure that we want our fans to know that we love what we do. We have a lot of pleasure, a lot of enjoyment, a lot of good times with the music that we make and the way we live our lives. We're so grateful to our fans for giving us this long life in metal. Check out the live Instagram feeds we do, they're very funny and entertaining. They show the fans a different side of Priest, and I think that brings us closer together. We're just a bunch of guys in a band, and like all the other bands all over the world, we all do the same thing, but we like to showcase the more human side of us, the more private side, which I think is more endearing and it brings us even closer to our fans. We want to make sure that our Singapore fans see that. When Judas Priest goes to work, it's a whole different experience out there, it's very strong, very serious and determined, but that's not who we are all the time. The other side of that, is the best thing about being a band with this amount of success after so many years and we're just having fun with that. Even 5 decades into our careers, we're traveling to places we've never been to before and those experiences will always be something that we'd love to share with the fans. It's not just about the music. It's important to us that the fans see every side of the band and there's nothing to hide with Priest. I think with how far social media has come, the more receptive you are to being open about who you are, the better things will work out. How does it feel to be constantly referred to and immortalized as one of the greatest bands of all time? It's a beautiful thing. We never expected these kind of accolades and awards. It's absolutely fabulous and it feels good, it makes us feel like our efforts and sacrifices have paid off. It also makes you more determined to do the best job you can do so we welcome that type of claims. It comes from the industry and more importantly, the fans and so it's encouraging. We're very grateful to receive it. The band has been around for close to 50 years. When all is said and done, and Judas Priest calls it a day, what is the legacy you wish to leave behind? I think it would be the legacy of a band that worked really hard for decades. It's a band that tried to be innovative and tried to break the rules and boundaries of what music can be or do. We've experimented with many types of metal because we're always trying to give fans a complete experience with Judas Priest. We've given millions of our fans a great time, wether they're just listening to us at home or even at a concert. All of those things, all of those metal memories will be cherished and I'm sure that we'll making great memories one more time when we return to Singapore this December with BABYMETAL. Judas Priest is set to return to Singapore this December with BABYMETAL for one night only at Zepp@BigBox on 4 December 2018. Get your tickets here.